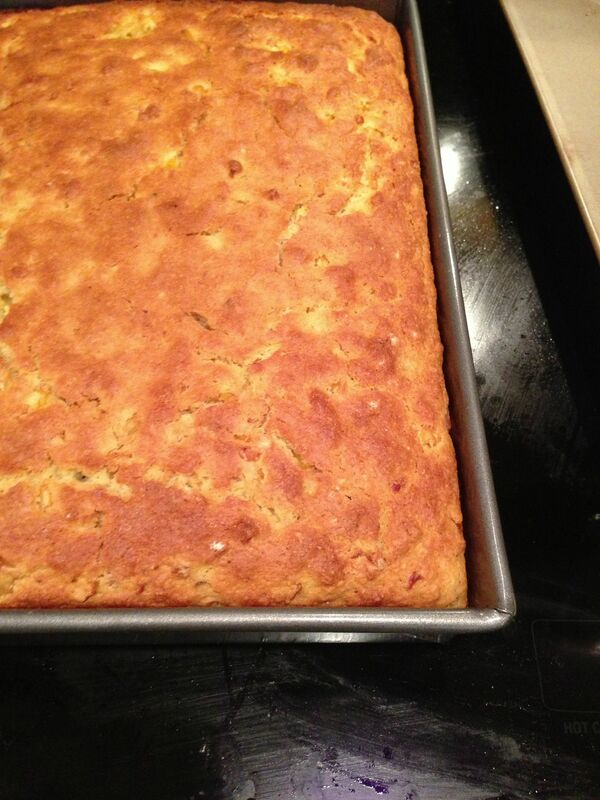 Perfectly baked corn bread; after about 1 hour in the oven. Smells great, tastes great. When tasked with making corn bread for the 4th of July Ribs cookout, I was terrified. There are so many corn bread recipes with so many different ingredients (Google lists 11 million just for Corn Bread recipes)! Even after you solve for inclusions (jalapeños, bacon, etc.) you still have to address the recipe for the regular ingredients. Do you use milk or buttermilk? Corn oil or vegetable oil? Creamed corn? Sugar or maple syrup? No sweetener at all? When that’s settled, there is a running discussion between the South and the North in this country about whether corn bread should have sugar in it, what it should be called (corn cake?) and whether it is to be served with something (honey butter, butter, etc.). Get that right and you’re still faced with the issue of texture: crumbly or moist? Bread-y or cake-y? See? Terrifying. So many ways to go wrong. You can go wrong 100 different ways with chocolate chip cookies and still people want to eat them. Corn bread has a much greater success-to-cliff chasm. I have always loved corn bread that is more like a corn muffin—especially those with corn in them like at Au Bon Pain and others–even though I certainly don’t go there any more except for coffee and definitely don’t buy corn muffins out at all. Not only because they’re not that great for you—they are cake, after all—but they so often disappoint. So my challenge was to find just the right mix of bread vs. cake and sweet vs. savory. To no one’s surprise, I found the ol’ reliable East Coast Grill recipe. I made a few changes. First, I doubled the recipe exactly, because my cast iron pan broke and I was making it for a party, necessitating a 9 x 13 pan. Secondly, I substituted buttermilk for milk. I did this mainly because I had extra buttermilk from making my chocolate cake recipe. Thirdly, I mixed the sugar with the wet ingredients as I always do, which is different from the recipe, which suggests mixing it with the dry ingredients. Lastly, I did not butter or grease the pan at all, and it was all fine. Next time I might adjust the salt a bit, as I like it a teensy-weensy more savory, but otherwise, this was perfect. Well, it became one more perfect after it was cooled and then toasted with butter. The corn bread is nearly perfect, but grilled corn puts it over the top. 1. Preheat oven to 350. Place a 9×13 pan into the oven to heat it up. 2. Melt the butter and let it cool. (Generally you don’t ever want to add hot butter to something with eggs in it). 3. In a large bowl, sift and mix together the dry ingredients: flour, cornmeal, salt and baking powder. 4. In a standing mixer, mix together the sugar, eggs, milk and oil. 5. 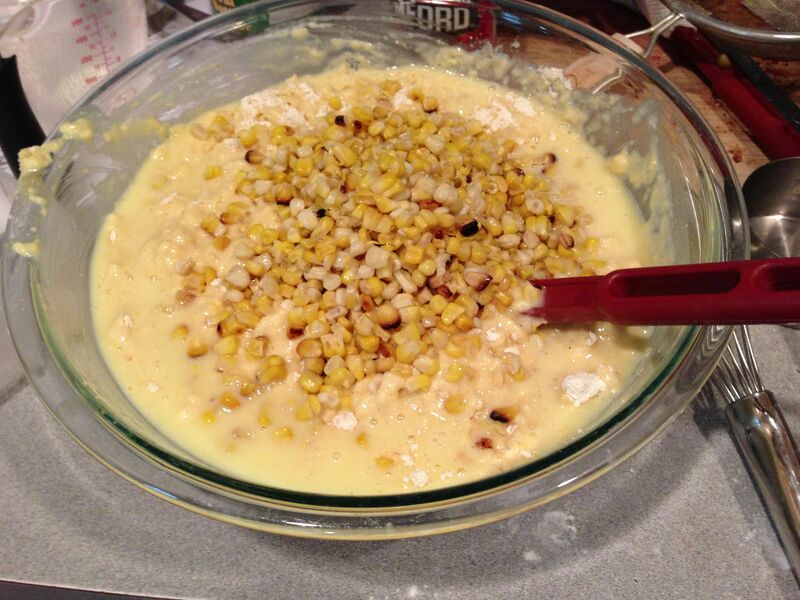 Pour the wet ingredients over the dry ingredients, then add the melted butter and the corn and stir together until just mixed. DO NOT OVERMIX! 6. Remove the pan from the oven and pour into it the batter, then give the pan a smack on the countertop to even it out. 7. Return pan to oven and bake, approximately 1 hour, until the corn bread is browned on top and a toothpick or a thin knife inserted into the top comes out clean. Try to resist eating it all because it looks bad when you bring only half a sheet of corn bread. Alternatively, cut into squares and eat half. Posted in Sides & Salads and tagged Corn bread, corn bread with grilled corn, corn cake, Corn Muffin, grilled corn corn bread, NY Times East Coast Grille Corn Bread, perfect corn bread, Robert Deutsch Baking on July 7, 2014 by Robert Deutsch. ← Grilled Lettuce for the 4th— Celebrate America!